One day you hear from a business leader, “We’re moving to a new cloud service, no risk in that -- right?” Or, the boss calls, “Sales wants to sign a new contract guarantying our response time to our parts customer, we run order entry off the cloud, no risk in that -- right?” As cloud deployments grow based on cost savings, IT and risk leaders are being asked tougher questions by external business partners, internal business leaders, auditors and regulators. Cloud Computing can be, well, cloudy. To evaluate and respond to risks, the basic risk management building blocks still apply. 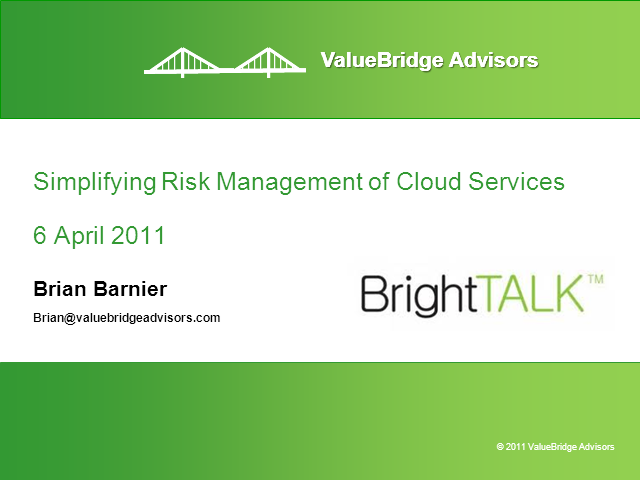 To kick-off today’s program, this session will provide an overview of an integrated approach to cloud risk management, drawing on a range of industry-recognized practices and guidance.